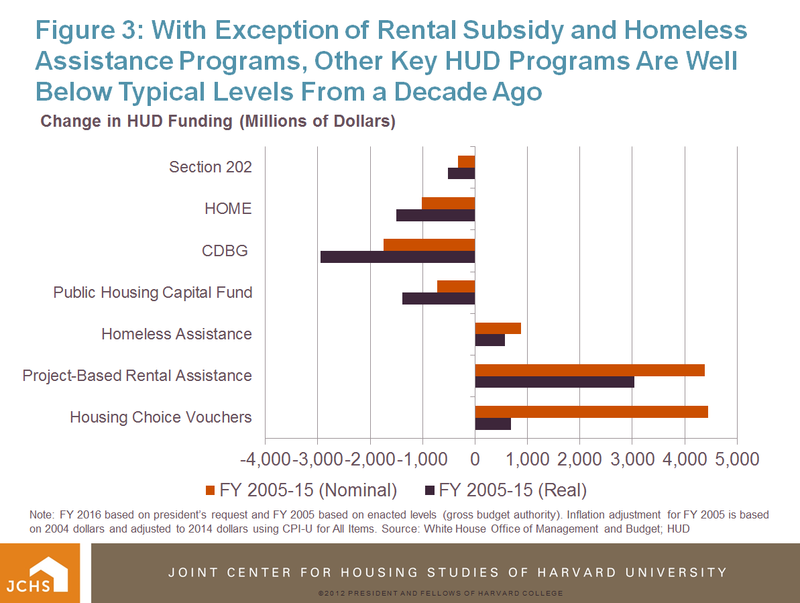 Housing Perspectives (from the Harvard Joint Center for Housing Studies): What Does the President’s Budget Mean for Affordable Housing? What Does the President’s Budget Mean for Affordable Housing? 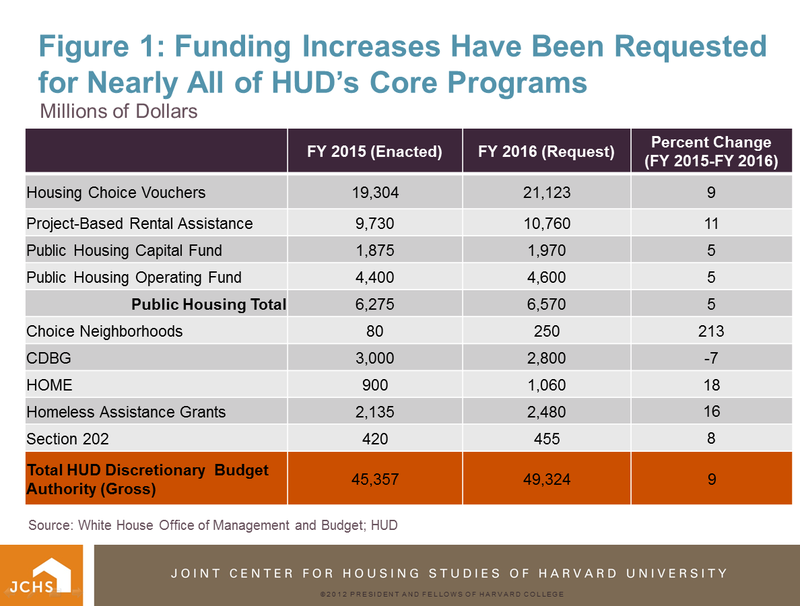 In his ambitious Fiscal Year 2016 budget submission to Congress last month, President Obama requested funding increases for nearly all of HUD’s programs, with significant boosts for rental assistance and homeless assistance programs. 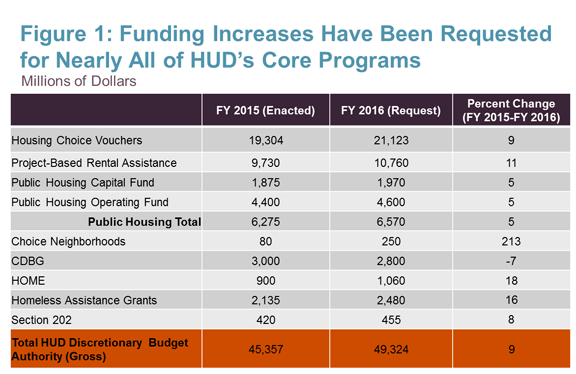 In total, the president’s budget has proposed $49.3 billion in gross discretionary funding for HUD programs, nearly $4 billion higher than the amount that Congress enacted in FY 2015 (Figure 1). 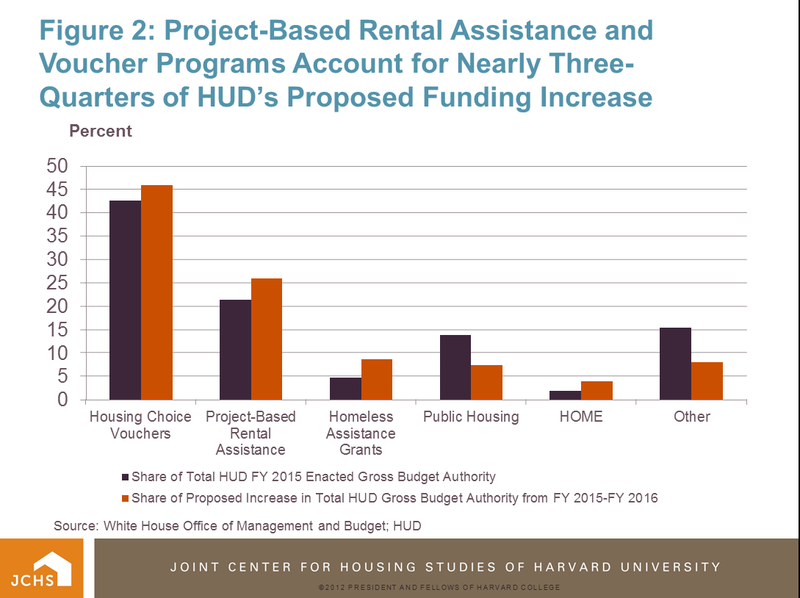 As HUD’s budget documents indicate, nearly three quarters (72 percent) of the requested $4 billion funding increase is dedicated to two core assisted housing programs: project-based rental assistance and housing choice vouchers (Figure 2). Together, both programs currently serve 3.6 million low-income households, according to HUD administrative data. The president’s request of $10.8 billion for the project-based rental assistance program is 11 percent higher than the FY 2015 appropriation and would fully fund 12-month renewals of all contracts and contract amendments. A complete calendar year of funding would eliminate the uncertainty of funding for owners with contracts that received less than 12 months of funding in FY 2015 due to the shift of the program from a fiscal year to a calendar year funding cycle. The budget has also proposed a 9 percent increase for HUD’s largest rental subsidy program, housing choice vouchers, which had been hit hard by sequestration cuts in 2013. The increased funding request would renew all existing vouchers for 2.2 million of the country’s most vulnerable households and restore 67,000 vouchers that were lost to sequestration. The voucher program assists households with the lowest incomes who would have difficulty paying for housing without a subsidy: 68 percent of voucher households have annual incomes of less than $15,000. If the president’s requested appropriation of $21.1 billion for the housing voucher program is enacted, the program would serve an additional 200,000 households (for a total of 2.4 million households). However, as market rents rise and renter incomes continue to fall, the growth of the voucher program has not kept up with the growing unmet need for rental subsidies over the past decade. Between 2001 and 2013, the share of very low-income renter households without assistance who paid more than half of their income for rent, lived in severely inadequate housing or both (those with worst case needs) jumped by 53.9 percent, according to a preview of HUD’s 2015 Worst Case Needs Report cited in the agency’s budget documents. Yet, the voucher program expanded by just 11.6 percent over the same period, addressing only a fraction of the growth in very low-income renters with worst case needs. Building on successful federal efforts to reduce homelessness among veterans using housing vouchers, about 45 percent of the restored vouchers (30,000) will be targeted toward additional groups such as homeless families and Native American households, as well as survivors of domestic and dating violence, and youth aging out of foster care. Unlike previous years, there won’t be any new VASH vouchers for homeless veterans; vouchers for this group will be rolled into the total pool of new vouchers. 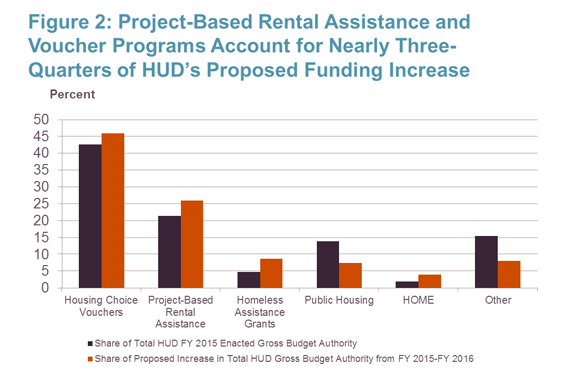 The President’s budget also includes a 16 percent increase in homeless assistance grants from the FY 2015 enacted level, which would help fund more than 25,000 new units of permanent supportive housing for the chronically homeless. Since the 2010 release of the first federal strategic plan to end homelessness, appropriations for homeless assistance have increased by 14 percent. In good news for many affordable housing advocates, the FY 2016 budget also estimates that $120 million in mandatory funding will finally be provided for the National Housing Trust Fund, the first new housing production program targeted to extremely low-income families since the launch of the Section 8 program in 1974. The Housing Trust Fund was signed into law in 2008 with the directive that it would be financed with contributions from the GSEs. However, before Fannie Mae and Freddie Mac could begin paying into the Trust Fund, they were hit hard by the financial crisis and were placed into conservatorship by FHFA in 2008; FHFA also suspended GSE contributions to the Trust Fund, stalling its implementation. In December 2014, after determining that the financial situation of the GSEs had stabilized, FHFA director Mel Watt finally lifted this suspension and directed Fannie Mae and Freddie Mac to set aside funds for the Trust Fund starting January 1, 2015. Additional budget highlights for FY 2016 include the proposed expansion of existing HUD programs focused on improving the economic self-sufficiency of tenants with vouchers and those in public housing, including expansion of the Moving to Work demonstration program, an additional $10 million for the Family Self-Sufficiency program, and an $85-million increase in funding for Jobs-Plus. The proposed funding increase for Jobs-Plus will be used to extend the program to Native American households. This year’s budget also outlines several new pilots, including a $300 million mandatory appropriation for a new local housing policy grants program and a rental assistance demonstration program in consultation with the Department of Health and Human Services (HHS) that aims to help older tenants in Section 202 housing avoid institutional care by integrating health and wellness into a housing-and-supportive-services model. 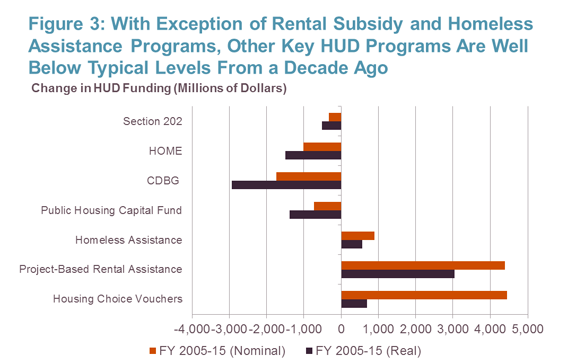 With a continued emphasis on demand-side subsidies such as housing vouchers, federal funding for necessary repairs to public housing—the nation’s oldest subsidized housing program—and other HUD programs such as Section 202, HOME, and the Community Development Block Grant (CDBG) is still well below typical levels a decade ago (Figure 3). The $455 million request for the Section 202 program is up 8 percent from the FY 2015 enacted level but includes no new construction funds and does not reverse a $327 million reduction in appropriations over the past decade. Furthermore, the requested FY 2016 appropriation for HOME is 18 percent higher than the previous year’s appropriation, but does not restore the 53 percent decline in funding between FY 2005 and FY 2015. The CDBG program was the only HUD program that did not see any funding increases for FY 2016, with the president’s budget proposing a 7-percent reduction in funding for the CDBG program from $3 billion in FY 2015 to $2.8 billion in FY 2016. This proposed reduction comes on the heels of a 37-percent decline in appropriations for the CDBG program over the past decade. However, part of the proposed decrease for the CDBG program in FY 2016 also reflects federal efforts to overhaul and modernize the 40-year-old program, including improved targeting of grants to the neediest communities. The CDBG and HOME programs will be part of a new HUD and Department of Health and Human Services (HHS) initiative proposed in the FY 2016 budget that enables states and localities to streamline and combine their CDBG, HOME, and HHS block grants into one flexible fund. Meanwhile, in spite of a proposed $95 million increase (5 percent) between FY 2015 and FY 2016 for the public housing capital program, the entire increase in funding would be used to expand the Jobs-Plus program and would not mitigate a 28-percent decline in federal appropriations for the public housing capital repairs fund over the past decade. However, the proposed expansion of the Rental Assistance Demonstration (RAD) in FY 2016 would continue to leverage private investment to help address the estimated $26 billion backlog in necessary repairs for public housing by converting public housing units to long-term project-based section 8 contracts. The budget has proposed eliminating the current RAD cap of 185,000 conversions and has requested $50 million to finance the conversion of another 25,000 public housing units.